“Metz Supplier of the Year” awarded to US Foods and “Metz Supplier Representative of the Year” awarded to Rob Burkart, VP of Healthcare and Education – Premier for US Foods. For US Foods in total to be awarded these honors, rather than one division, it means a lot of moving pieces are working very well together. Metz Culinary Management, a leading provider of dining management services, has awarded “Metz Supplier of the Year” to US Foods and “Metz Supplier Representative of the Year” to Rob Burkart, VP of Healthcare and Education – Premier for US Foods. 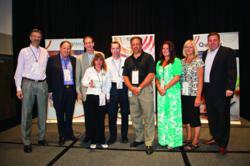 The top vendor awards were handed out at the annual Metz Summer Leadership Conference, held at Penn State University this year. Technology is a big reason US Foods was awarded Metz Supplier of the year. Metz works with 13 different US Foods divisions and thanks to a recent push to synchronize all of the company’s divisions into a single technology platform, US Foods can now produce the exact same SKU, or item number, for tens of thousands of products. This successful effort has allowed US Foods to initiate cutting-edge food distribution initiatives like Menu Profit-Builder Pro, Proof Of Delivery (POD) and SCOOP premium menu items across all divisions nationwide. Menu Profit-Builder Pro is a recipe database that analyzes the cost of every recipe used – an enormous researching tool unique to US Foods. It also offers a full nutritional breakdown. POD mandates that every single item that comes off the truck must be scanned. This produces a more accurate delivery and if something is missing, the program automatically generates an updated invoice. The new SCOOP premium menu items are rolled out three times per year - spring, summer and fall. The labels created for SCOOP are Chef’s Line, Metro Deli & Molly’s Kitchen. These premium products are available exclusively at every US Foods distribution center in the country. Burkart was recognized for his tireless pursuit of servicing the customer, top-notch professionalism and exceptional follow-through. Metz Culinary management has handed out annual vendor awards since 1994. Metz Culinary Management provides dining and environmental management services for clients in a variety of settings, including hospitals, public and independent schools, colleges, long-term care facilities, corporate offices and manufacturing facilities. Metz is a family-driven company that collaborates with its clients to deliver restaurant-inspired hospitality to each and every guest. In 2011, Food Management Magazine named Metz one of the Top 20 Management Companies in the U.S. and one of the Top 5 Firms to Watch. For more information on Metz Culinary Management, visit http://www.metzculinary.com.